When do I need to make payments? What’s an installment? What fees do you charge for different things? We have the 411 on paying for your place! What’s Telko? Why is Telko, Inc. showing up on my bank statement or why do I have a transaction in my online account that refers to Telko, Inc. in Bloomington, IN? That’s easy! So, one of Elkins Apartments’ operating companies is named Telko, Inc. Telko, Inc. is often the holder of the account that handles tenant payments, especially ACH ones through our portal. As a result, the transaction is Telko, Inc. dba Elkins Apartments, or something similar. However, this is often truncated by your banks reports, and you’ll only see something like Telko Inc d Electronic Debit, or something similar. Rest assured, if you see a credit or debit on your bank statement and it says Telko, it should be related to your account with Elkins Apartments. If you don’t recognize the transaction, give us a call. Remember, ALL transactions handled by our portal are set up by the users. With a very few exceptions related to a handful of parents, we do not setup accounts or initiate transactions. However, we are happy to help explore why one of our transactions ended up on your account if you don’t recognize it. But… did you ask your children? Sometimes Little Davey sets one up and doesn’t let mom or dad know about it. Its happened… more than once! So, again, Telko, Inc. is Elkins Apartments and Elkins Management and Development. If you are leasing a home or apartment, or a vacation rental, with us, and initiated an electronic transaction, there’s a good chance it will show up as Telko, Inc. on your statement. If you see a $51 fee in the portal, this is for card processing. Don’t pay it, use e-check instead! (Or just pay with a check). SUMMARY: Effective Q1 2018, you may now make Credit and Debit Card payments through your portal account. These are handled solely by RPPS, have a fixed fee of $51, and we do not control the service (or the fee!). All support is through RPPS. If you have a need, feel free to use your card, although its a lot more cost effective to pay by ACH. How do you avoid this fee? Simple, don’t pay with a card! Credit cards are not a normal payment channel for us. Your lease specifically requires payment via check or equivalent. By choosing to pay with a credit or debit card, you agree to a $51 fee. We try very hard to inform you of this because we do not want you to waste money, but many tenants asked for an option to pay with a card, even if it costs them, so we allow this. What about debit cards? I don’t want to use a credit card, just a debit card…. When you use a debit card in most systems it is still processed through card processing networks. 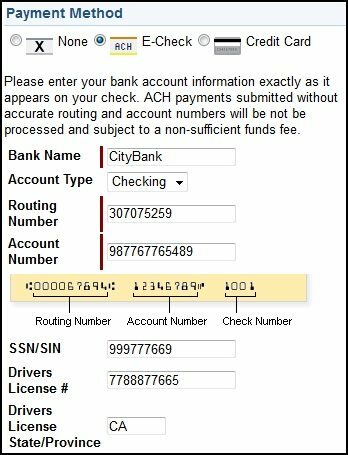 If you are trying to pay with a bank account, via “ACH” or “EFT” or “E-Check” (all things that means the same thing), then you set it up as an e-Check using your bank account number (NOT usually the number on a debit card) and the bank routing number. This is on your checks (and may be obtained from your bank). We relay this… a lot! We send multiple emails with subject lines like “EA FAQ: What’s this about a $51 processing fee? Save money, read this! Don’t pay it!” AND the processing steps involve telling you about the fee, you ADDING the fee yourself, and you approving the fee. Sheesh people, just don’t do it. Card-based transactions are handled solely by a third party processor RealPage Payments Services. RPPS imposes a $51 fee per transaction. We do not control nor receive any part of this fee. RPPS charges this transaction fee recoup their costs and the percentages charged by card companies, and is calculated based on averages of all transactions. Again, we have no control over this fee. In fact, it will not even show up on your ledger and is charged directly to you. We do not provide support for, nor recommend (or not recommend), these services and provide them simply as an option for those with a special need or desire to use a credit card for a payment. RealPage Payments Services provides all support for these transactions. Its true that it generally doesn’t hurt to ask, but given the above, you might want to ask nicely and start with a giant mea culpa, right?! Use checks or e-check instead! Or just pay with a check, right? So, you made a payment to one lease on your account when you meant to pay to another lease on the account. Accidents happen, right? Can we fix it? Yes, we can! (In most cases). Read on McDuff. when a resident is living with one group at a location and staying at that location but with some different people. In both these cases, residents will typically have two leases attached to their portal accounts. One will be the current, “Active,” lease and the other will be the new “Draft” one. The most common error is when the renewing tenant means to make a payment to the new Draft lease–the one for the next year–and accidentally chooses the Active one (the current year). Oopsey. There cannot have been a balance due. Because everyone is jointly and severally liable on the leases, if there was a balance due, then the new payment will have been applied to the balance due first-in/first-out, and therefore the payment would not be able to be transferred. In this case, the current tenants simply need to pay off whatever the balance was so that there is sufficient pre-payment on the account to transfer the funds to the new account. Once you work out among yourselves who needs to pay for the balance, we can transfer the payment over to the other account. Just send us a note when your pre-payment amount on the old account is at least as big as the payments you want transferred to the new one. When we transfer a payment, we have to use a mechanism called a Journal Entry. It will remove the money from one account and place it in the other one. One limitation of this mechanism is that all journal entries are listed in the name of the Primary Lessee on the account. So, when you are keeping track of who has paid how much, you will want to make sure you account for this transfer correctly. We will have a note on the entry that clearly says whose payment it was; however, one column will have the Primary’s name, even if the payment was not that person’s. Not a huge deal, but worth remembering as you keep things sorted out amongst yourselves. Mistakes happen. We are happy to help! So, if you made a payment to the wrong account, just let us know and we will help you sort it out. ePayments can fail, just like checks can bounce, and if that happens you are charged a return fee and need to replace the payment. So, you received a notice that your ePayment failed. Not good, now what? First, make sure it was YOUR ePayment that failed. Everyone on the lease gets a copy of the notification because you are all responsible for all charges and payments. So identify whose payment went haywire. ePayments are credited immediately, but they take 3-5 days to fully process. NSF/Insufficient Funds. Just like a bounced check, the epayment will bounce if you do not have enough money in the account. Calling your bank to see what happened on their end is the first step. You may also reach out to RPPS, our epayment provider if you think it is an error. RealPage Payments Services provides all support for these transactions. Consumer support toll free telephone number: 1-844-530-5785. Start with your bank though. Bad Account. This is a setup issue. Usually it means there is a typo in your routing number or bank account number, or you switched the two. Double checking the numbers is the first step here. Sending us a voided check will allow us to do this for you. In both cases, if you happen to have more than one epayment account, making sure you actually selected the right one is a good step. This is documented in the transaction, and we can access it in the audit trail–even if you change the numbers or the whole account on your account after you initiated the failed transaction. If you can’t find the reason for the failure, do NOT just reprocess it as it could fail again and lead to more and more returned payments. In any event, we are happy to help you try to sort it out. So, that happened…. now what? You will be charged a Returned Payment, just as if you bounced a check. This charge is specifically listed in your lease. When your payment fails, we get charged by our bank, and by our third party processor, AND we have the expense of following up with you. This Returned Payment charge recoups those expenses. Once failed, if the failed payment causes the account to be in arrears, then the system automatically applies late fees back to the date the payment should have been made, and your account continues to accrue these until paid. Bottom line: Work with us to fix the problem and make a replacement payment as soon as possible so you don’t run up a lot of charges. E-Payments are posted to your account immediately; however, they do not fully clear for 3-5 business days. We credit your account with a payment, and provide a receipt, as soon as you initiate an electronic payment. However, it generally takes 3 to 5 business days for an electronic ACH payment to fully clear the system. NSF/Insufficient Funds. Just like a bounced check, the epayment will bounce if you do not have enough money in the account. Calling your bank to see what happened on their end is the first step. In very specific circumstances, we can delete a payment if you catch it quickly and meant to make it for a larger amount, but it has to be rather soon after it was initiated (hours not days). Just don’t dispute it, because that will cost you and us fees from all banks, and they’ll be past back to you. Not good, right? Your Elkins Apartments tenant account portal is the easiest way to check your balance, make payments, and submit work orders. How do you login? 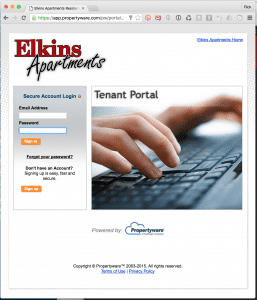 Simply go to the portal login, also available from the How Can We Help menu of our elkinsapartments.com website. https://app.propertyware.com/pw/portals/elkinsapartments/tenant.action or just navigate to elkinsapartments.com and choose Tenant Account Management from the How Can We Help dropdown menu. NOTE: MOBILE DEVICES often will not work for the first login. Please use a desktop to login the first time. You can try mobile, but most people are unsuccessful… ymmv. Choose Forgot Password and enter the email address you provided us. If you provided one version of an email address to us, but are using another one to try to login, it will not work. Your email is your unique userid, and no other system in the world will consider, say, bob@indiana.edu to be the same as bob@umail.iub.edu (or whatever). No luck? Send us a note. If you cannot guess your email address when doing the password reset, and you cannot locate the original email notice (to verify your address), then send us a note with who you are and where you live and we can look it up. Maybe there’s a typo, or maybe you used an old address. Either way, we can look it up for you and, if necessary, change it. There are a few other situations that can cause the system to balk at letting you login. Your account might not have been activated (that’s easy for us to fix for you), or you might have two contacts in our system with the exact same email–the system won’t know which “you” you are so it will not let you in. All easy to fix. Regardless of the issue, we can sort it out. Hundreds of our tenants successfully use the portal every month to pay bills, review their ledger, and submit work orders. Its rock solid. If you run into a problem, I’m sure we can help you figure out what’s going on, no problem! Parents and other third parties who are not named on the lease may not access the tenant portal. The tenant account portal is intended solely for those individuals who are named on a lease either as lessees or as co-signers. You, and others named on the lease, are our customers, and your lease and payment information is privileged and private, between those named on the lease, and us. However, third parties CAN setup payment accounts for our tenants. This is no different than, say your own, your parent’s, or someone else’s credit card accounts. You wouldn’t expect someone to be able to call in and talk to your credit card company about your account, because the account is something between you and the credit card company. This is true of our accounts as well; however, its even a bit more restrictive because in many cases we have jointly and severally liable accounts. That is, there’s more than one of you on the shared accounts. As a result, our policy is simply to disallow any third-party access to account information. Parental co-signers are generally allowed portal access; however, this must be a formal co-signer named in the original lease. Note that this is also true for when third-parties call in to talk about your account. This is your account and your lease, and we cannot disclose information about the account to others via email or over the phone. We make exceptions for the case of confirming that a specific payment initiated by the third-party has been received or to discuss other aspects of third-party payment. That is, if you are a parent and have sent a check, or are trying to set up electronic payment, we are happy to discuss these specific details. While we know this may be frustrating, especially for those who may have children who are just taking flight on their own–I’ve been on your side of this myself as a father, the bottom line is that the accounts are our customer’s accounts and we all have to respect their rights as adults. 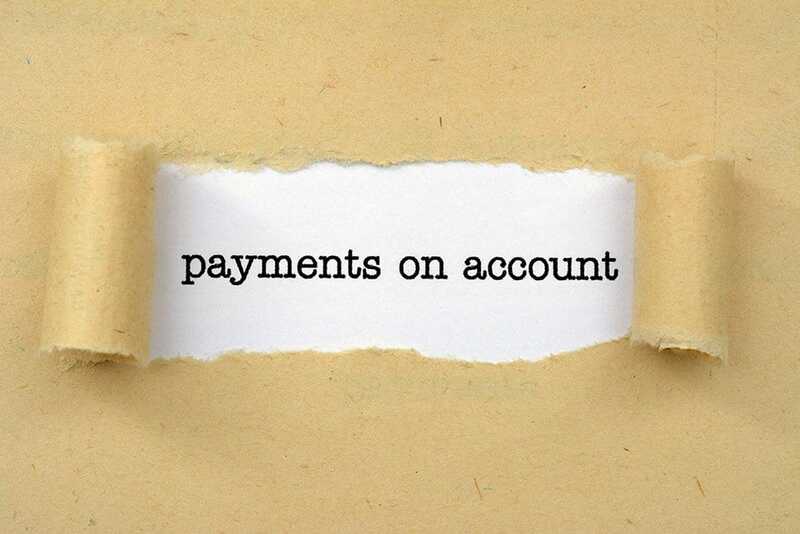 Third-parties can set up ACH payment accounts and automatic or one time payments for your Elkins Apartments account. 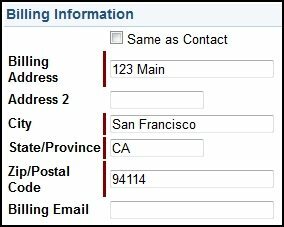 OR completely filling out and submitting, along with a voided check, our Third Party Electronic ACH Setup Form. Those named on the lease should set their electronic payments up using the account portal and may not use the Third Party form. When setting up the electronic payment account, the third-party has the option of setting up automatic monthly payments for whatever amount they choose and with whatever start and end dates they would like. 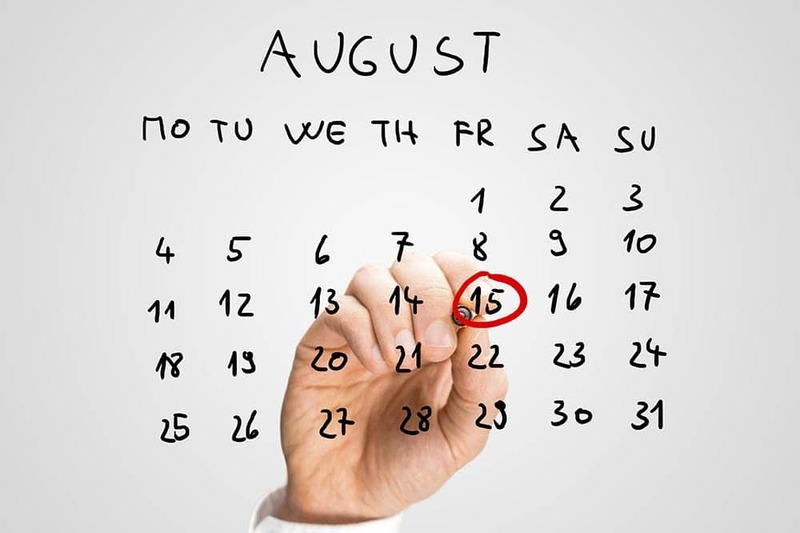 For most leases, this would be August of year one through June of year 2 (July is covered by the initial “Last Installment” usually paid in May of the previous year). For third-party one-time payments, once the account is set up once, additional payments may be authorized at any time by emailing the office. Note that such manual requests must be received at least 5 days before the payment due date in order to be considered on time for that payment date. That is, if you are making a payment for the 15th, please don’t email at 11:59pm on the 15th (even worse, say on a Saturday night) and expect it to count as paid on time… if you are forgetful or wait until the last minute on things, why not set it up as an automatic payment instead? If you run into any problems, let us know. We can help! Hey. The payment portal is telling me there is a payment pending and won’t let me make another one. Why can’t I make more than one payment? How long will it be before I can make another payment? Wow. We totally want your money, so that’s a bummer. Let’s take a look at why this is happening. Why can’t I make more than one payment in a given period of time? The bottom line is that our third party ACH processor will not allow you to stack multiple pending payments. If you make one payment, then you may not make another payment from the same tenant account until the first payment fully clears. This is pretty common. Try it on a credit card account some time. You generally cannot have more than 1 payment pending in the queue. In fact, most companies won’t let you have more than one ACH (bank) payment in the queue even if you are trying to do them from different bank accounts. We have no control over this, as it is handled by our third party processor. However, among the many possible reasons for this, we have to assume its to avoid stacking multiple payments and having them all fail in a cascade, which would lead to significant accounting issues AND failed payment fees for you, and for us! Generally, it takes between 3-5 business days for an ACH/e-payment to fully process and the payment remains ‘pending’ until it clears. Bottom line: try to pay for everything, including utilities and such, all at once, rather than one at a time. Plus that will save you $2.00! We are happy to help you sort out your account access and financial obligations for your place. However, initially only tenants named on the original lease have access to the tenant portal. A sublessee (“subtenant”) is not “named on the lease” as one of the original “Tenant(s.” And, the primary contractual relationship on the sublease is between you, the subtenant, and the person who subletted the place to you, the sublessor. As a result, the original tenants named on the lease may not desire another person to see the financial history for the account, a situation heightened if the account happens to be among multiple leasemates sharing a co- and severally liable account. Or, they may not care. In either case, we do not provide portal access third-parties that are not tenants on the original lease. If you are only wanting to be able to make electronic payments, we have a form for that. It has a lot of flexibility and can be set up usually within hours. You can also be provided full access to the portal if you get written permission from all the original lessees. We are happy to help you in anyway that we can. Our goal is to protect the privacy and rights of all our tenants, lessees and sublessees alike. Let us know how we can help! Yes, we think its weird too, but our property management system will sometimes send out the notification of a charge and it will not have the full data for the charge in the email. Worry not. The charge is correct inside the system. The notification is simply a courtesy. Simply login to your portal account and you can see what the charge is actually about. Btw, its simply not possible for us to actually enter in a $0 charge, so if you see one, you know you have had the chance to observe this little ghost in the machine. We have asked the vendor to explore this particular issue since it is, we agree, a bit odd and annoying, but it doesn’t happen often nor does it have an impact on actual accounting so it is not a high priority for them, much to our chagrin. So, when it doubt, just look it up! Your security deposit and the first and last installment are all due before you move in. The security deposit is due at signing, the last installment on May 15 before you move in, and the first one August 15th the year you move in. This is specified in the lease in the top right corner, big, bold schedule o’ payments. 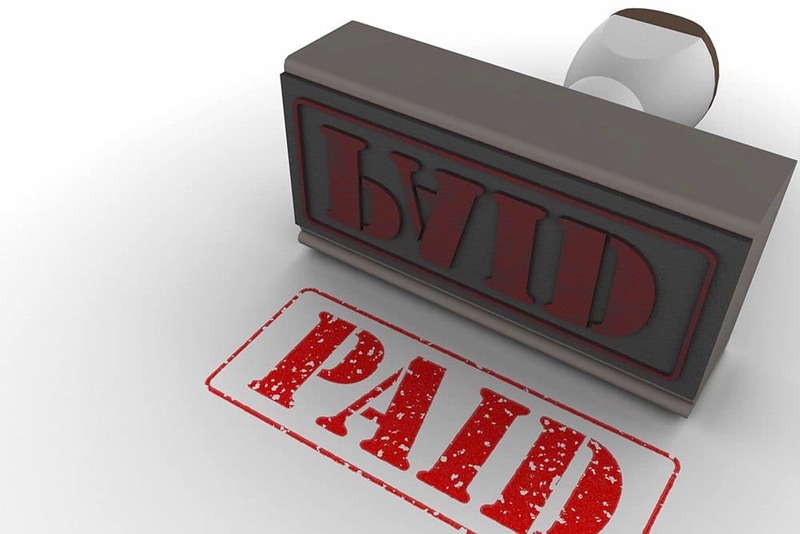 Note: This typically means you have already paid the July installment (the “last” one) for the following year (so if it’s the 2019-2020 period, you would not owe a payment for July 2020). The secdep, last, and first installments need to be paid by everyone on the lease before anyone can move in. That is the lease account for any and all co- and severally liable groups needs to have a $0 balance before anyone will be allowed to take possession of a place. What’s an installment? How’s it related to pro-rata rent? You will receive notices about charges to your account if you have an email address on file with us. What are these all about and when are they due? There are two types of charges you will receive a notice about: autocharges and one-time charges. Auto-charges are things that happen each month, like rent installments. One time charges are things that happen occasionally, like maintenance charges, additional rent for late payment, etc. Autocharges for rent installments generally post to your account between the 1st and 10th of the month. Payment for these autocharges is not due until the 15th (for most of you, please check your lease for confirmation of due date). Autocharges post early so you can see what’s due and pay it before its due. Payment for new autocharges is not late and additional rent for late payment does not accrue until the 16th. While the charge will be on your account, if you login to the portal, it will not be in the Balance Due section until the 15th (check Total Unpaid instead). You can pay the charge at any time electronically from your bank through the portal. Just because a charge posts does NOT mean you have a balance due. You will get a notice of the charge posting even if you have prepaid because it is simply a notice of the charge going onto the ledger. Note it doesn’t mean you don’t have a balance due either either. Check your portal. The notification is for the entire charge to the unit. This is the full amount due from everyone in the unit. How much you personally owe is between you and other people on your lease (if any), but the notice is about how much your unit owes. Because you are co- and several liable, the entire amount is due from each and every one of you. Other charges are due immediately. Other charges are not subject to a late fee until the next regular rent installment due date (e.g. if you are charged for maintenance on the 7th, it must be paid no later than the 15th or will be subject to our late payment policies and procedures). If you have a previous balance due, that balance will be paid with your payment first before the new balance. So, don’t freak. The notice is simply letting you know that a charge has been added to your ledger, but…. On the other hand, if you get a Balance Due notice. Well, then you owe money and should definitely check it out. When in doubt, send us a note through the portal! Thanks again for choosing to live with us. How can we help you? Payments are applied first-in, first out. Any existing charges are satisfied by ANY new payment, from the oldest charge to the newest. Any prepayments on an account also apply to the oldest charge to the newest. ALL CHARGES ARE PAID ON A FIRST IN, FIRST OUT BASIS. You may intend a payment to be for rent in full; however, if you have ANY outstanding charge, your payment will be applied to that charge first and if the payment is not sufficient to cover the outstanding charge(s) AND your current rent, then you will have a balance due on the current rent and late charges will accrue from the due date. You can write “rent” on a check, but if you have an outstanding balance say for water or a bounced check, etc, that’s what your payment is going to go to first, just like a credit card account. When you intend to prepay rent (compared to your roommates), your payment will first go against all existing charges. So, if your roommates have not yet paid (slackers…), then your payment goes against those charges, and not in as a prepayment for your personal share (remember, we NEVER account for “personal shares”). Your roommates would absolutely owe you, and we can help sort that out if you put a note on your payment that indicates what you intend it to be for (that way, you can look it up later), but you would not have a ‘credit’ on your account in your name. This is because in essence ‘your account’ is your unit’s account, NOT your own account. This is simply a result of the “all for one and one for all” nature of a jointly and severally liable lease. Your lease has a balance due that must be paid in full before moving in. Handling it before move-in day will make for a much smoother move. We strongly recommend handling this before move-in day because hiccups in regards to having a zero balance will slow you down (and probably really aggravate you—and we want you to be a happy camper!). You cannot move in until the entire balance on the account is paid (not just your “share”). If you live with others, because you are all jointly and severally liable for the entire balance, the obligation due from each and every one of you is for the full total unpaid amount. This is true even if you have paid separate payments from your lease-mates and have paid what consider your share (as determined among yourselves), no one can move in until the entire balance is paid. You are all in this together and generally speaking it’s not up to us to track who has paid what among yourselves. Its so very important that you understand joint and several liability and how important it is for you and your fellow lessees to keep track of payments. If you have pending student loans that are the basis for you being able to make payments and they have not yet been disbursed, that is okay; however, you will need to upload a copy of the documentation to your portal, send it in an email, or bring a copy when you plan to check in. Certain payments, especially credit cards, may not be posted to your account immediately because they are not a normal payment channel that we support. If you request to make a credit card payment and do not see it on the account, please email (or send a note through the portal) and we will confirm it. In the end, does your account have a ZERO Total Unpaid? If not, let’s figure out why not and make sure you get it to ZERO before move-in. Thank you for choosing to live with us. We look forward to seeing you. How can we help? All for one and one for all! When leasing a place with friends, you are ALL responsible for the full amount of the lease. Joint (or “co”) and several liability means that each tenant is responsible for the full amount of the entire lease obligation. This is the typical way leases are structured everywhere, and is how our own lease, that you executed with us, also reads. This also means, and this would be true pretty much anywhere you go where you share a lease, that you have only one account–one lease, one account, one big bucket that all the expenses and payments, even pre-payments, go into–which is exactly the nature of joint and several liability: all for 1 and 1 for all! We do not bill individual amounts and we do not track individual amounts because our relationship is with you as a group and what you and your leasemates choose to do, how you divvy up payments, who pays a little more for a nicer room, whatever the deals are you work out, are absolutely none of our business. Most the time, people split rent evenly, but that’s up to you! As a courtesy, we usually allow you to make separate payments but keeping track of who has paid what is up to you, though we are happy to help. I paid my “share,” why do I get late notices and do I owe money? You and other people on your lease may be allowed to make individual payments. You personally may have paid all of what you and your friend’s decided was your fair share (usually the total amount divided by the number of people on the lease–though that is entirely up to you, of course!). However, that does not mean you do not owe any money…. As a group, you owe all the obligations due under the terms of the lease. It is solely up to you to track who owes what to whom and to divvy up, and correct, any overpayments or underpayments by specific people on your lease. We will help, and we will provide one no-cost ledger review session for when you run into issues, but, in the end, it’s up to you to keep good records. We moved out, I’ve paid my share, but my roommates haven’t. Am I done? This is a variation on the above. Let’s say you’ve done a good job of staying up to date, but one of your friends (who shall remain nameless), well, not so much. At the end of the lease, you move out, and you personally owe nothing among your group but your group has a balance due of, say, $2000, because your buddy hasn’t gotten caught up. Who is responsible? That would be all of you. And, not as a group, but individually as well. And if we have to file a court case, it will be filed against all of you. Any judgment, under co- and several liability, will be against all of you, and payable by any of you. This can be a huge deal for you if, for example, you are the first one who seeks a loan for something, say a new house! Whoever does that will find the judgment against them and will be unable to get it removed until it has been paid in full. In the end, it’s very important to understand that obligations under a lease are truly like the three musketeers: all for one, and one for all. Meaning, everyone is responsible for paying, even for the debts of one person on the lease, and, moreover, one person may be held responsible for the entire amount, all alone. It’s like one big bucket, and its your responsibility to determine who put what into the bucket, and who owes the bucket…. Yes, if you are named on a lease, you may use electronic (ACH) bank payments to pay your rent, deposit, or any other Elkins Apartments charges (sorry, you can’t buy ice cream or beverages this way). If you are a third-party, such as a parent, they may set up an electronic payment account using our third-party form. Note, that in the portal, there are also options for Credit/Debit cards and Cash. These are handled solely by RealPage Payment Services and incur various fees. For CCs, its a flat $51 per transaction. Hefty, not in our control, and your call whether you really want to pay with a card. BUT ACH is easy and you’ll never be late again if you setup autopayments! Choose eCheck when setting up your account. You may also choose credit cards. However, those are handled by RPPS and incur a $51 fixed processing fee per transaction. To make an electronic ACH payment, you need to have access to your account in the Elkins Apartments Tenant Account Portal. Payments are due on the 15th. Online payments are a convenience. If you have trouble making an online payment, this does not change the due date for the payment. Transactions will appear on your banking statement as “Elkins Apartments” or “Telko, Inc. dba Elkins Apartments” or a variation of these depending on the length of the field your bank allows. The bank processor adds a small $2.00 convenience charge to all electronic bank transactions processed through the portal. You can also set up auto billing so your account is automatically charged every month for the same amount. Again, there IS an option to use a credit card or debit card. This is entirely handled and supported by our third party processor. This was added at the request of tenants who had emergencies. The processor charges a $51 flat fee for this. We do not control nor receive any of that fee. If you do not wish to pay the fee, then simply do not use a credit or debit card. Let us know if you have any problems. Thanks again for living in one of our homes for rent, apartments, or townhomes throughout Bloomington, Indiana. We very much appreciate your staying with us. Please note that it is your responsibility to ensure payment is received in the office by the end of the day on the 15th of the month. Technical issues, problems setting up your account, especially if you wait until the last minute to try to make an electronic payment, will not absolve you of any delinquency that occurs as a result. Bottom line: electronic doesn’t mean wait until the last minute, which is never a good idea! Credit card and ePayments are optional methods of making your monthly payments. You agreed to deliver a check to the office, paying in full, by the 15th of the month. Anything else is late, regardless of the reason. Payments must be received by the 15th of the month. None of the above are acceptable reasons for late payments under the terms of your lease. * Note that once ePayments are set up and used successfully once, they are great for last minute payments (as long as you don’t have a payment already pending). In most cases, there are no issues with setting up ePayments or using credit cards. However, again, in most cases if you run into problems, the bottom line is: You agreed to pay by check, received in the office by the 15th, and anything else is optional and doesn’t absolve you of being late—though we will try to help, and to be understanding about special situations. Getting email that starts “Dear SomeOneNotMe”? You are receiving these because our notification system uses a salutation for the primary contact on the lease. However, the message is about everyone on the lease, altogether. If you share a lease with other people, and you are not the primary contact on the lease, any system generated messages that you receive will be addressed to the primary contact. These messages are still about you (and your leasemates) as a whole. So, a message may start: Dear SomeOneNotMe. This does NOT mean SomeOneNotMe owes money and you don’t, or that they made a payment, and you didn’t. Most system messages will say Dear SoAndSo, where so and so is the Primary Contact. These messages are still about you—as in you and all your fellow lessees, together. Any balances due, payment notifications, and charges are about all of you together. Because you are jointly and severally liable, we do NOT separate out who owes what. We will help you sort it out from time to time, but keeping it straight among yourselves is completely up to you, or you can pay with a single payment each month, whichever is easier. So, if you see a lot of messages addressed to you, it means you are likely the primary contact. If something is sent to you with a fellow lessee’s name on it, it’s still about you if you received it. Of course, if you are getting emails addressed to someone and you have no clue who the person is, then, well, we may have a bit of a problem (or you don’t know who you are living with…). Definitely let us know. So, you don’t want to deal with remembering to make payments every month, and you haven’t yet set up your account to do auto-payments from your checking account. What are you going to do? Make a prepayment, of course. And of course Elkins Apartments will let you prepay rent and other charges on your account (or set up those automagical e-payments too). Hey, we want your money too! And if its easier for you, or for someone else paying for you, we are happy to take it…. wink wink. You can pay any amount you want in advance, any time, and we will make a note in your account as to what you intended the amount to be for. Living solo? That’s all you need to know. If you live by yourself, there’s no other considerations. You make a payment in advance, it becomes what’s called a “Prepayment” and it will automagically be applied to any new charges on your account, until the Prepayment is all gone. If you live by yourself, pay away and anything you personally pay that is above the amount you have due is simply and very clearly set aside and will be automatically applied to future charges. Pretty awesome. You need not think about it until you “run out” of prepayments. If you live with others, it works the same way, but its a bit different because your are all in one big bucket together. Remember the whole jointly and severally liable thing? Well, when you share a place with others, all your charges and payments are put into one big bucket. And, as you may recall, it’s up to you to keep track of who has put what into the bucket. This doesn’t technically affect how a prepayment is handled but it does affect how your particular payment may be handled. The important thing to remember is you personally do not have an account but that everyone on your lease shares one account and all its charges and payments. For folks who are co- and several liable, we treat any and all payments from you as payment for any and all charges. We do this because of co and several liability and we cannot, by the same terms of the lease, change how this is handled even if you want us to. We have to treat all your charges and payments like they are in one bucket that you are all mutually responsible for. This is because once the money is put into the bucket, we are not responsible for determining whether a particular payment is truly an “overpayment” by a person because it is not up to us to keep track of who has paid how much among yourselves–and we aren’t mind readers, unfortunately, so we really don’t know what you all agreed to amongst yourselves. So, for example, someone might “accidentally” pay a payment in July when one normally isn’t due under the lease, yet that person may owe money relative to the others on the lease… this might even lead to a credit balance (a balance less than zero) but what if Bob paid 14 times, and Steve (the “accidental” one) paid only 12? Then Steve’s accident really wasn’t an accident, and Steve owes Bob (well, owes the bucket…and the bucket owes Bob…). Complex… yes. And your job to keep track, and to sort out afterwards. For us, we simply treat all payments as valid, apply them to the account and if, by chance, there is a credit balance at the end of the lease, then it will be handled as a line item credit on the account reconciliation, that includes the security deposit accounting. In some very limited cases, if all parties to a lease agree to allow a refund to a specific person of a payment claimed to have been made in error, and if certain other account criteria are met, then we will consider processing a reversal of a payment to a specific person. In general, however, all payments, once made, go into the balance, and you as a group should determine who owes the person in the future. And if you accidentally mess up an epayment, contact us immediately because we can usually cancel if caught within a few hours. All of this really isn’t any different than when you all split a pizza (just a lot bigger numbers!). 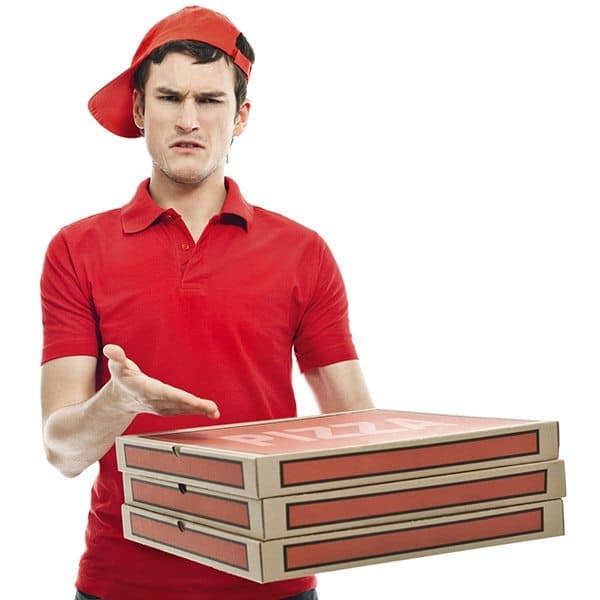 The pizza guys don’t care who pays what, and they don’t let you get part of the ‘za just because you paid what you consider your portion (“hey, dude, my buddies are tapped, can I just pay for a couple slices and you take the rest back?” N0pe, the whole pie needs to be paid for, and if you paid 5x what you agreed to, in order to ‘pay in advance’ then ‘za guy is going to apply all your money to the current ‘za if your roommates are deadbeats. Of course, your roommates then owe you, and that’s the key thing here as well. You pay more than your share, it is applied to the account, and your roommates owe you. So, when you intend to prepay rent (compared to your roommates), your payment will first go against all existing charges. So, if your roommates have not yet paid (or are deadbeats), then your payment goes against those charges, and not in as a prepayment for your personal share. Your roommates would absolutely owe you, and we can help sort that out if you put a note on your payment that indicates what you intend it to be for (that way, you can look it up later), but you would not have a ‘credit’ on your account in your name. This is because in essence ‘your account’ is your unit’s account, NOT your own account. Here’s the most common situation where trying to prepay rent can cause issues among roommates: let’s say you go in and pay 6 months of rent (this happens a lot, especially if parents or guardians are involved OR if someone will be travelling). This is applied to your account. It pays the bills. In fact, it pays several months of ALL your units charges. Your unit shows not balance due for a few months, then a new charge shows up, and your roommates owe “more than their share”–that is, they will owe not just their usual cut but a bigger number because you’ve been subsidizing them for a while. What have they been doing with that ‘extra’ money? Who knows, but they may not have it now, and, uh oh, what do they and you do? In the end, the key thing is to make sure everyone has paid their share EVERY month, even if someone prepays rent in advance. Just keep a checklist on the fridge, and check the ledger online from time to time. It will save you a ton of hassle and ill will amongst yourselves (and toward us, because even though its not our doing, everyone wants a target for venting…). We can help you track the prepayments by adding a note. BUT, we can help. What we can do is put a note on each payment as to who made it and what they intended it to be for (say 4 months of rent). But this note is just to help you sort it out with your roommates. If you make the payment using the online portal, just use the same portal to create a conversation with us, and post the note there. How do I check my prepayment and balance? You will want to have an idea of when the Prepayment is all used up, because we have no way to automatically tell you that it’s all used up until you have a balance due that hasn’t been paid but other than that, you’d definitely be all set and have no worries until you burn through the Prepayment amount. You can check your balance and your prepayments through your online account portal. An alternative, by the way, to prepay rent is simply to use the portal to set up automatic monthly payments. Wham, bam, payment made every month, on time, every time, with no intervention from you. Your ledger can get complicated. Sorting out who has paid what and who still owes what can be a challenge. We are happy to go over your ledger and help determine who owes what, and, Hey!, the first one’s free! Your “ledger” is a list of all charges and all payments on your account. The ledger is the accounting tool that shows exactly what has happened in your account over time. Your ledger can get quite complicated, and challenging to interpret, if you and your roommates have decided to make separate payments directly to us. When you do that, you multiply the number of entries that occur in the ledger, so instead of a single charge and payment, you could have 5-6 payments, perhaps a late rent charge, and other items, and then you own money, and wonder: “who owes money?” Well, good question! For example, you owe a $2,500 monthly installment. You pay in a single ACH payment in your portal for $2,500. Balance due=$0. Easy! The next month, repeat. Oh, maybe you have a maintenance charge, you see it, pay in in your lump sum, or as a separate check. Still pretty straightforward. Separate Payments. Losing track of things. Complicated! Your portal can help you stay on top of things. As can the payment and charge notifications that our system automatically sends. And, checking your ledger before sending in your checks can really help. Do that in the portal too. Oh, why not just make your payments there. See a zero balance. Done. Awesome! Of course paying with a single check is a lot simpler. Keeping it Straight is Your Responsibility. But We Will Help, and the First One’s Free. We’ve had more practice with complicated ledgers, and we are happy to help you out. We can help sort through your ledger, even sit down with you to go over it together. And the first one’s free! However, it is important to realize that although we offer this service, it takes time, and it’s really your responsibility as co- and severally liable tenants to pay the full amount and to keep track yourselves of who owes what. If it becomes a habit, say each month we end up going over your balance and who owes what because you aren’t keeping track, then we will charge an accounting review fee per our standard policies and procedures. We may require you to pay the entire amount due with one check, and work it out among yourselves. Have a balance due but not sure why or who? Want to do it yourself? Person 3… until you run out of roommates. You can add a column beside both charges columns for Notes if you like. Then enter all the charges and payments from your ledger onto the spreadsheet. Do a Sum on the columns. This sum will show the total of all charges and of payments, with the payments broken out by person. You can tell how much each person SHOULD have paid by taking the two total charges columns and adding them together and then dividing by how many of you there are (assuming you decided to split costs evenly). You can tell how far off each person is by taking this SHOULD HAVE PAID amount and subtracting the actual column amount for that person. Heck, some of you may even be owed money among yourselves. Your Tenant Account is a good place to find your payment history, including, in most cases WHO paid, and with what form of payment. Yes. Although you are jointly and severally liable for your lease, you may, in most cases, make separate payments. Many property management companies insist you pay your full installments in one check and work out your payments among yourselves. Not Elkins Apartments. We want to help. So, we allow you to make separate payments on your account. ANY amount due on your account is due from all of you, regardless of who has paid to date. It is solely your group’s responsibility to determine who owes what among yourselves. You should make someone responsible for keeping a record each month of who paid what. We will always do our best to try to help you sort it out if you run into problems. We record the payments received and who each is from. Your tenant portal can be very useful for determining what your balance is, and who has paid what, and when. Even if you have “paid your share,” you will receive late notices and be obligated for any amount not paid by anyone else in your place. If your account is delinquent, it does not matter if only 1 person or 5 caused the delinquency, your delinquent account charge will be $4 * the NUMBER OF PEOPLE ON THE LEASE * THE NUMBER OF DAYS LATE. This is additional rent for any unit that fails to maintain good standing. So a 5 person lease, at 6 days late would be 5*6*$4 or $120 and continues for everyday that an account fails to be in good standing. Some of the thorniest customer relationship issues we encounter, and some of the most confusing ledger issues, revolve around trying to help you figure out who owes what. This can be frustrating to you and we ask that you keep in mind that these issues are solely related to being allowed to pay individually. We provide a ledger review services to help sort out who owes what, and the first one’s free! But again, its up to you to try to keep it straight. The system is simple and industry standard, but things get wonky when tenants make lots of payments for different amounts. That’s NOT an issue with how we, or the system, accounts, but rather with how myriad payments are made among yourselves. If it becomes a problem, and causes bad will between you and us, we may insist you pay monthly in a single lump sum; however, we prefer to provide the service of allowing you each to pay individually. Even if you pay individually, you remain co- and several liable for the apartment and all obligations under the lease. Once you have set up an online payment account, you can schedule an auto ePayment to automatically pay your rent from checking account. You can choose a start date for recurring payments. You can cancel the auto ePayment at any time. You can also make one-time payments online. Set the Start Date to the 10th of the month, to be safe, and the End Date to after that date on the last month you wish to autopay (e.g. Start Date, August 10th, End Date, June 12th). 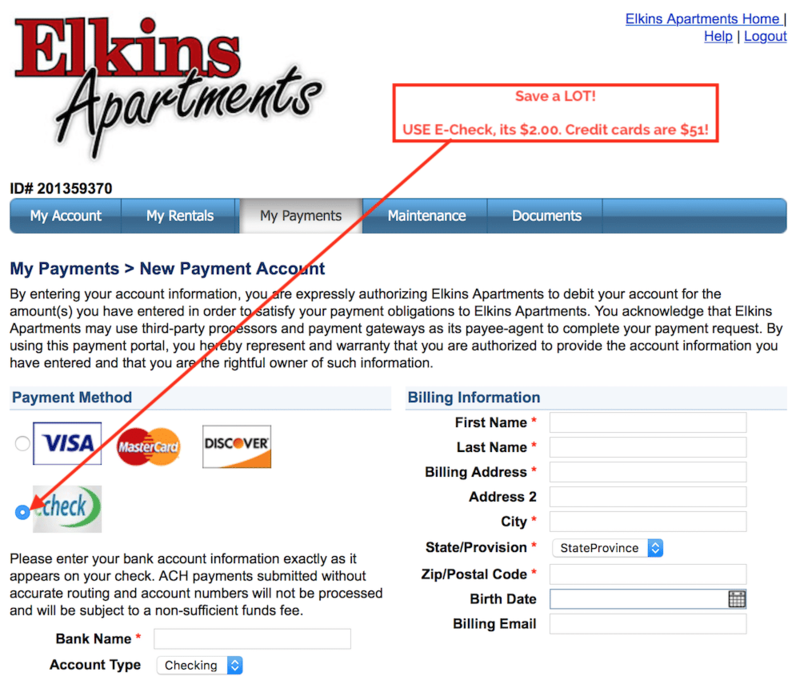 Click the Auto ePayments button from the My Rental tab of your Elkins Apartments tenant portal. Complete all required fields and confirm the amount, including the current processing fee. For Start Date, we recommend you use the 10th (and not the 15th). This gives you a chance to correct an error or NSF before the 15th comes around and perhaps avoid additional delinquency charges. For End Date, choose a date a few days after the LAST MONTH you wish to make a payment. So if you expect your last payment to be in June, and you set your Start Date to August 10, then put June 17th as the End Date and it will do the last one in June. Click Next. Note: please make sure you set the End Date to a sometime AFTER the last payment you wish to make, but before the month after that, or you will have instructed the system to make more payments than you may have intended. Similarly, don’t leave the End Date BLANK or you are basically telling the system to do it forever (or until we terminate your lease at move out). That’s it! 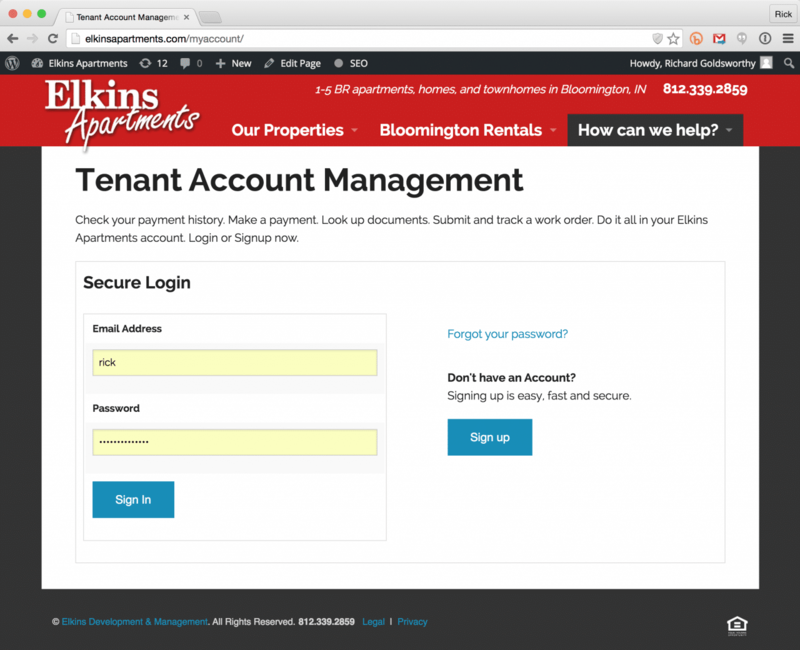 You have now scheduled an auto ePayment to be drafted from your checking account to pay for your Elkins Apartments apartment or rental home in Bloomington, Indiana. Contact us if you have any issues with the system. Electronic NSF/Be sure you have money! If you set up an autopayment and you do not have sufficient funds in your account, it will generate an NSF just like a check will, and you will be charged our standard NSF fees along with other charges until the payment is made in full. Due Dates Don’t Change. Due dates will not change if you have technical problems with setting up your payment. Change/Delete Autopayments. 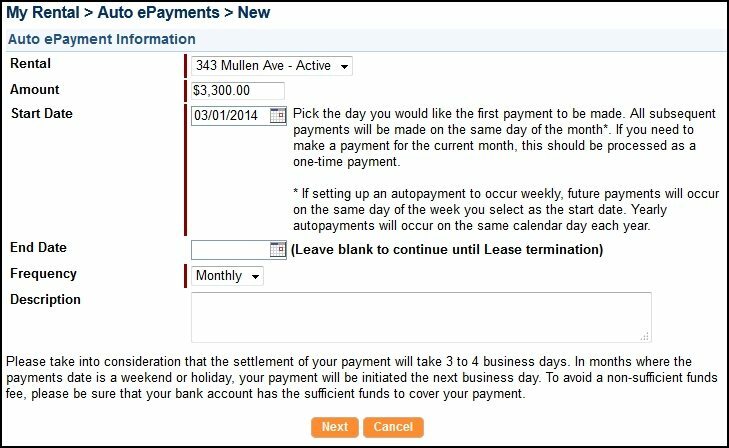 You can modify or remove an autopayment at any time from the same screens you sent them up. Just click Auto ePayments from the My Rental tab. Once you are logged into your online account, you will be able to set up an online payment account and pay your rent online. First, you need to set up your payment account. You will be able to set up automatic checking (E-Check) payments. Always look for the eCheck image or the words eCheck or ACH.There IS a credit card option, but its spendy. Your call…. Fill in your Bank Account information and your Driver’s License OR SSN/SIN. The system will validate your bank routing number. You should double (triple!) check your Account Number. NOTE there is now a date of birth field that is required! Enter your billing address for the account your are setting up to make payments for your Bloomington rental house or apartment. Save your Account information and you should be ready to make an online payment or set up autopayments. Yes! 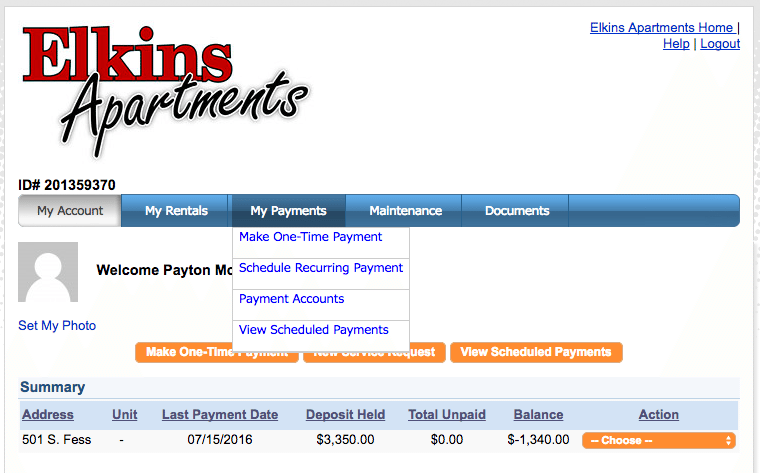 You can check your Elkins Apartments account balance online through the EA Account Management Portal. Just go to elkinsapartments.com/myaccount and login. You will need to use the email address you have on file with us. 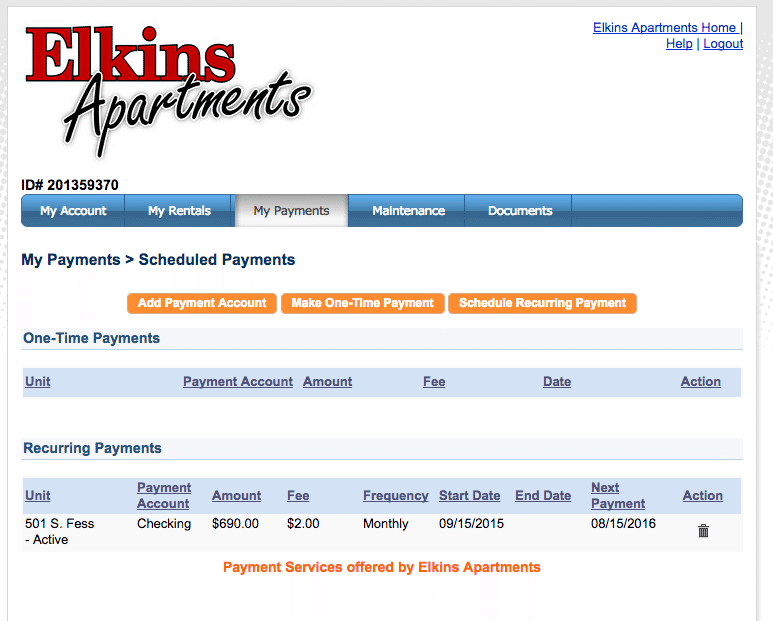 Now you can access your Elkins Apartments payment and charge history online, make an electronic checking payment, and submit and track work orders. Manage all your Bloomington apartment or rental home transitions from your desktop or mobile device. You can review your charge and payment history, make a payment, submit a work order, and more. Note that our system was transitioned in November of 2015. Therefore ledger history prior to that date is listed solely as “Prior Balance.” You may request the previous ledger by sending us a note directly via email or through the account management system. For IU students, many of you provide @indiana.edu accounts but then try to use the different subdomain x.iu.edu email server accounts. So if you have trouble with matching on one of them, try the other. Issues? Send us a note. Credit cards are accepted as a courtesy option via the portal, cost $51 per use, and are handled, charged, and supported solely by RealPage Payment Services. UPDATE: Credit card payments are no longer being accepted via electronic invoice, in-person, or over the phone for any balances due on your account. We no longer support any form of credit card payment made directly to us. You may, however, use a third party, through our portal, to make a credit or debit card payment. There is also a “cash payment” option, called RentMoney, now available as well. In the past, we have, in special circumstances, we allowed tenants to make payments via credit card. This was a benefit offered in special circumstances and required a lot of manual entry on our part, and an adjustment to our underlying cash pricing. You CAN make a credit or debit card payment in the portal if you really need to do so. These are solely handled by RealPage Payment Services. The fixed fee is $51 – of which Elkins Apartments receives… $0–and RPPS provides all support. These transactions are handled solely by a third party processor RealPage Payments Services. They impose a $51 fee per transaction. We do not control nor receive any part of this fee. Yes, we think this is high, but it exists for them to recoup their costs and the percentages charged by card companies, and is calculated based on averages of all transactions. Again, we have no control over this fee. In fact, it will not even show up on your ledger and is charged directly to you. If you don’t want to pay the transaction fee, we totally get that, and this is simply something we chose to offer because people asked. However, we recommend you make payment by check or ACH per the terms of your lease. That’s what we’d do. Or, pool your payment on a single card, then have people on your lease pay you back. Quite literally, “the more you pay the more you save.” So if you want to earn miles/points/whatever, you can do so. Save the $$, use e-Check! It’s easy, and has a very small processing charge. Or, just pay by check, on time! We do not accept unsolicited inbound payments through third-parties. For example, in Paypal, you might try to initiate a payment to us by sending it to our email address. If you choose to do so, and if we choose to accept the payment, then you are solely responsible for any additional charges that the third-party may charge to us. These charges, which may also include a processing surcharge of $50, for the time and effort required for EA to handle these non-standard payments, will be posted directly to your ledger and are non-refundable. In most cases, there are no issues with setting up ePayments or using credit cards. However, again, in most cases if you run into problems, the bottom line is: You agreed to pay by check, received in the office by the 15th, and anything else is optional and doesn’t absolve you of being late–though we will try to help, and to be understanding about special situations. We say this because, every once in a while, we receive, um, sternly worded notes to the effect that “I’m having trouble setting up my online payment. It’s not working, and don’t you dare count me as late.” This typically is on, say, the 15th, late in the day. To which, all I can say is: seriously? That said, if you set up the portal, and you set it up wrong, the FIRST time this happens, we usually will waive any associated late fees as long as you correct the problem within 24 hours of being notified. Fool me twice: if it happens again, you may get dinged for the late fees from the initial date due. This is true of issues with credit card payments as well. We get that setup can be a challenge, don’t stress about it. But if it becomes an issue, we reserve the right to hold you to the terms of the lease (and any time we choose to waive those, it doesn’t mean we lose the right to enforce them in the future, etc, etc). Let us know if you run into trouble, we are happy to help! Note. Please never ever (ever!) provide your credit card information in an email. That’s just a terrible idea! Yes. Our rates, offers, and other fees always reflect a Cash Discount. Payments with credit cards will include an adjustment to the payment amount to reflect removal of the cash discount. Your annual lease amount, rent payments, etc, generally already include a discount for payment in cash (check, ACH, money order, cashier’s check, and equivalent, cash itself is not accepted). If you would like to pay with a credit card, or other non-cash equivalent, then you acknowledge and agree that charge will be added to your account balance to reflect removal of the cash discount for that portion of your overall balance that you are paying for with the credit card. Non-cash pricing is generally 4% higher than cash pricing and may be subject to a minimum transaction amount. If you need to make an alternative payment, such as with a credit card, please inquire for the non-cash pricing. Happy to help you with that too! Did you accidentally make an automatic epayment? Set it up to automatically go longer than you intended? Let’s see what we can do…. Say you set up your account to make automatic electronic payments. That’s a really good idea because it means you aren’t likely to ever be late, which is great. BUT let’s say you also either set the end date to later than it should be, or, worse, you didn’t put any end date. The system, like a credit card monthly payment choice you might set up to autodraft your bank account, is not you and it is no where near as smart! It just does what it is told. If you tell it to make a minimum payment, or to pay $X per month, and to do so forever, it will do exactly that. Just like doing that with a credit card, the system will keep doing it until told otherwise (by deleting the instruction, or contacting us and having us modify it for you) or the account closes (which for us is when your lease is terminated, at move out and deposit reconciliation). We get that it can be upsetting if you mistakenly set it with no end date, or with one later than you think was necessary, but in the end, computers just do what you tell them to do…. So, if you set up your auto epayment without an end date or with one past when you planned to make a payment, well, its going to just keep on making the payment until the End Date criteria is met. If it is not set at all, that criteria will never happen so it keeps on doing it until the account is terminated. We’d catch up with it at termination, and, again like a credit card, would send the money back to the primary account holder along with any other account reconciliation that needs to happen (e.g. Security Deposit!) because it would appear as a credit balance on the account if it wasn’t applied to existing charges. Sometimes people aren’t thinking about their “last” installment and set the end date for July. What happens? Well, if you set the end date to July of your lease year, then you personally will end up having one more installment pulled from your bank account. This is because for most leases, the “last” installment is paid before you move in, and this last installment covers July, so July is already paid, so if you end up paying in July because of when you set your autopayment to end, then you end up paying more than you probably planned to pay. This is the first thing. Log in, go to your recurring payments, and delete the payment. Do this now! Otherwise, it will do it again the next month if the End Date still hasn’t happened! If you can’t handle it, just send us a note saying “please delete my auto epayment” and we will do it for you, no problem. You may overreact and just delete the account, and that would be bad, because the only way we will process a payment back to you personally (versus to the primary contact on the account as part of security deposit reconciliation), is if we can reverse it back to the account it was paid from, and then only if a few other things are met. Let’s look at those…. Let’s talk a bit about what the payment means. From our perspective, someone has an account, and they made a payment to that account and we have no way of knowing whether they intended to do so or not, and if they didn’t, and we totally get that mistakes can happen, then we will only know when you tell us. Can we refund the payment directly to the payor once they tell us? Maybe…. and we try to do so, but its a bit more complicated than it may seem. Its not as simple as ‘hey, I gave you X but didn’t mean to so please give me X back.’ And, its even more complicated if you are on a jointly and severally liable lease (that is, if you have roommates). Let’s look at a few things about refunds…. Has the payment cleared our bank? We can’t address any sort of refund until the payment has fully processed and cleared our bank. If its in a pending status on our end, then we won’t address it until it clears. Note, if its REALLY early, within hours of initiating the transaction, we can sometimes DELETE a pending payment, so get with us as fast as possible! Is/was there a balance due on the account? If your account had a balance due, your payment, even if you didn’t mean to make it, is owed on the account, and will be applied to the balance due. Since its all one bucket, and its not up to us to determine who is paying what, your payment gets applied to the shared account balance. Also, remember, if you are on a lease with other people, then you are all jointly and severally liable on an account, so while you may have paid what you consider your fair share, if there’s a balance due, then that’s something you would need to take up with your housemates. You didn’t dispute it. Good. That saved you anywhere from $50-100! Now, we need you to sign a quick electronic document affirming that you have not and will not dispute the charge (because if we refund it, and you dispute it, and you effectively end up with double the money, we will not be happy, and there will be financial, and potentially legal (because that would be fraud), consequences. Yes, this has happened on occasion, and no it didn’t go well…. Is your electronic bank account still in place? We only return the payment by reversing all or part of the payment via the electronic account you used to process the payment. So DO NOT delete the banking information. If you remove the banking information and we are not able to issue an electronic refund of the payment, then resolution of the problem will revolve to the deposit return process (i.e. the money will be accounted for and returned as part of the deposit return process). Are you a part of a jointly and severally liable lease? Since jointly and severally liable leases have one shared account, all charges and payments to that account become part of the shared account and are no longer simply attributable to a specific individual. As such, refunds or reapportionment of funds is something that is better left to the roommates to handle among themselves. When a request is made to us to issue a refund to a specific person for whatever reason, then that request must be agreed to by all parties to the lease (again because the payments and charges are part of one shared account once made). Any overpayment, mistaken or otherwise, is a credit balance on a lease account. Beyond all this, basically any payment to an account that was intended for that account is applied to any current or future charges, FIFO, and any credit balance is resolved at account closeout–or can be resolved among roommates themselves in the case of jointly and severally liable accounts. We want to help you out, and we understand mistakes can be made. In the end, the terms of the account do not make provision for a “mistaken” payment. You send a company a check or make an epayment when you didn’t mean to, no one will just hand over the money if you have a balance on the account. Try it. Make a payment to a credit card company, then call and ask for it back when you had a balance due. Just won’t happen…. and if it does, you’ll likely be socked with fees, interest, etc etc. Even if you make a payment when there’s a $0 balance, companies will not refund that money for a period of time in order to protect themselves from fraud. Did you know that if you accidentally make a rather large overpayment to a card company, not only might it come to the attention of their fraud department, but likely the authorities as well. This is because of an increasingly common overpayment/refund scam being pulled on all sorts of companies. In any event, if there is any question about what is going on, then the resolution of the credit balance will be that of the lease process: any credit balance on the account at the time of lease termination will be included in the security deposit reconciliation process and any money to be refunded will be sent to the primary contact on the lease. It would then be up to the lessees (on jointly and severally liable leases) to sort out who owes whom money. However, as noted above, we are willing to work with individual payers to reverse the payment. Send us a note quickly if the mistake happened recently, we might be able to catch it and simply delete it. If not, please complete a request for a e-payment reversal and we will see what we can do. Deleting an auto ePayment that you set up is very easy to do from your portal account. So, you set up an auto-payment to pay your rent, great idea! Way to avoid those late fees! Note, you cannot edit a recurring payment. To CHANGE one, just delete it and re-create it. Lease payments are due on or before the 15th of each month. Your payment needs to be received in our office (not postmarked) by the date specified in your lease, almost always the 15th. Delinquent accounts are accounts that have a past due balance. The charges accrue for each and every day that the account is past due. This is often because someone missed an installment payment, but it can also be delinquent if you had a specific charge added to your account, say for a previous delinquency or for maintenance and such and did not add that amount to your payment. Payments might be received after the 15th but the account has a negative balance because someone prepaid: then that would not be a delinquent account. But everyone might have paid on time and yet you have a delinquent account because the balance is not zero. Something worth knowing in this regard is how payments are applied: first in, first out. This works exactly like a credit card account: payments are applied to the oldest charges first, and a non-zero balance for the previous month means delinquent charges. Holidays, personal catastrophes, network outages? Payments are due on the 15th. If that’s a Sunday, please ensure delivery by Saturday. If its a national holiday, then payment is due so it is in the office before the holiday. The 15th… means the 15th. Plan ahead, or better yet, setup automatic payments and fuggeditaboudit. We can also accept credit cards in person or over the phone, but please remember that our overall lease amount and the payments reflect a cash discounted price. You may not be able to pay over the phone on a national holiday or Sunday, so please plan ahead. You usually can pay with credit card online. Returned checks (NSF) are assessed a minimum $50 fee + late fees. Any tenant who has an NSF check must pay with money order in the future. We reserve the right to collect the rent with one check even if we have accepted separate checks. NSF’d ePayments are subject to the same rules and fees as regular “bounced” checks. Failed ePayments that are rejected because of bad account data are subject to a late fee from the date the payment was originally due. If you pay individually, note that you are still co and several liable for the apartment and the rent. It is not our responsibility to tell you who owes what, although we will always do our best to try to help you sort it out if you run into problems. We record the checks that are received and the amount of rent is expected to be paid in full, regardless of who has paid what. Acceptance of late rent does not waive the rights of Elkins Apartments with respect to the lease agreement. Failure to enforce late fees is not a waiver of rights. Some of this may seem harsh; however, we simply want you to be aware ahead of time so you can avoid any issues. We don’t want your bonus money (though we will certainly take it): we just need to be paid on time so we don’t have to carry your debt and use staff time to remind you, etc. We’d rather spend the time helping ensure you have the best possible experience with us! It seems like I’m not staying 12 full months, are some of my months prorated? No, usually not, because usually you are making 12 monthly installments (not 12 payments for 12 months of rent). This is a common confusion. The bottom line is that you are making installment payments on the entire amount of your lease. The pro rata discount is already factored into those installments. If you are leasing a place for “a year,” as most of your are, then your term, in your lease, has specified start and end dates. You are actually leasing the apartment for that period of time, a period typically of approximately 350 days (again, the period is fully specified in your lease, look it up!). You agreed to pay a specific amount (again, see your lease) for that entire period of time. The entire amount could be paid before you move in—we’d love for your to do that by the way! However, for most leases, we allow you to make 12 equal monthly installments on that full amount. These are not rent payments for the month, instead they are installment payments. If you actually had a lease for the entire year, which is never the case, then the cost, and the related monthly installments, would be higher. Let’s look at an example. Let’s say you lease a 1 Bedroom Unit in Apartment Complex Istanbul (which is really nice, by the way, but a bit far from campus). * You agree to lease the apartment for a cash discounted total of $9600 for the duration of the lease (approximately 50 weeks). A monthly installment on this amount is $800 ($9600/12). You would also, of course, owe a security deposit equal to 1 monthly installment. If the lease had actually been for all 52 weeks, then the total lease amount would be approximately $9,984. Again, we do not offer such full year leases. You will find that this is how practically all leases are handled here in Bloomington. This allows time for you to move out, for us to fix the place up as needed, and to move someone else in. “Hey, I’m moving in in the middle of the month, is my rent pro-rated?” No. Installments are divided evenly to cover the full amount of the lease, NOT based on the period you are in the place each month. “Hey, I’m moving out in the middle of the month, is my rent pro-rated?” No. See above! Installments, not monthly rent. Now, when might your rent be pro-rated? Under some circumstances, you might either get a pro rata refund OR owe additional pro rata rent. Those will always be when we mutually agree to change the start date or end date of your lease. You might move in early, and there would be a per day charge equivalent to a pro rata rate of the full term (i.e. take the amount of the lease, divide by the number of days in the term, and you get a guestimate of the prorata early move in charge). This charge is always based on the entire rent for the location regardless of the number of people wanting to move in early because your account is jointly and severally liable and there is no “my share” involved, its one big bucket, not individual accounts per person. Similarly, you might be want to stay longer, and you would have a holdover fee in those cases. These and other changes to start and end dates might incur pro rata charges or refunds because the requests extend beyond the scope of the original lease. * Where’s Complex Istanbul? I’d like to see it. Hmmm. Istanbul was Constantinople, which is also mentioned in a song by They Might Be Giants. It’s not really an Elkins Apartments complex. See Google Maps.